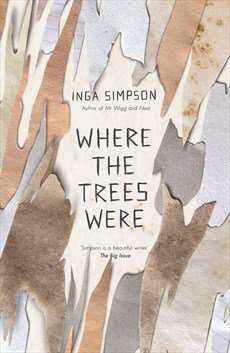 Inga Simpson’s Where the Trees Were is a story that, at its heart, is about growing up and living in modern Australia. Its connecting tissue, the issue of cultural appropriation and the ongoing tousle between preservation of Aboriginal culture and land use, gives the story a depth and resonance beyond the individual characters and their lives. It is 2004 and Jayne is a conservator at a major cultural institution in Canberra. As the book opens she is organising the theft of a carved tree from the museum collection. The tree, once one of many that dotted the Australian landscape and marked places of cultural significance to the Aboriginal communities who lived there, has been reduced from its previous significance to an exhibit. Why Jayne does this and how she deals with the fallout are examined through the rest of the book. Flashback to Jayne’s childhood, told in first person, growing up the only child of a farming family in the Lachlan Valley, central New South Wales. Starting in 1987, this aspect of the novel follows Jayne and her close group of friends, all boys. In alternating chapters, Simpson follows the group as they leave primary school and enter the adolescent and confusing world of high school. Early on, the group finds a circle of carved trees on Jayne’s property. They instinctively know that the trees are special and make a pact to keep them secret. Both aspects of the narrative are handled in a sensitive way. The young characters talk and act and respond to tragedy in the way that a reader would expect. The grown Jayne’s ethical issues, her work situation and the relationship with her partner Sarah also feel unforced and authentic. The relationship between the two time periods, how events of childhood and adolescence impact on the characters’ actions as adults is clear. Where the Trees Were deals with or mentions a number of issues beyond cultural appropriation, but generally the issues are well illuminated and arise organically from the characters. Simpson takes a very definitive stance on many of these issues but there is little direct polemic. While she has some Aboriginal characters, including one of Jayne’s childhood group, Simpson walks a fine line of dealing sensitively and respectfully with aspects of Aboriginal culture from a white Australian perspective. Where the Trees Were is a very Australian novel in the best way. It illuminates an aspect of Australian history that is often ignored, and it highlights an ongoing issue that requires some attention and effort. But it does so through the eyes and experiences of ordinary Australians, dealing with all of the other trials and challenges of living in this country during the latter years of the Twentieth Century. There definitely is an element of left-wing wish fulfilment in the conclusion but by that time both Simpson and her characters have earnt it.